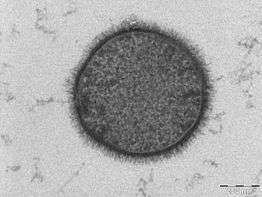 A TEM image of the polio virus. The polio virus is 30 nm in size. Transmission electron microscopy (TEM) is a microscopy technique in which a beam of electrons is transmitted through an ultra-thin specimen, interacting with the specimen as it passes through it. An image is formed from the interaction of the electrons transmitted through the specimen; the image is magnified and focused onto an imaging device, such as a fluorescent screen, on a layer of photographic film, or to be detected by a sensor such as a charge-coupled device. TEMs are capable of imaging at a significantly higher resolution than light microscopes, owing to the small de Broglie wavelength of electrons. 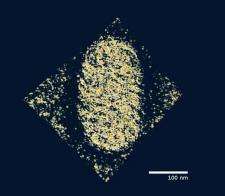 This enables the instrument's user to examine fine detail—even as small as a single column of atoms, which is thousands of times smaller than the smallest resolvable object in a light microscope. TEM forms a major analysis method in a range of scientific fields, in physical, chemical and biological sciences. TEMs find application in cancer research, virology, materials science as well as pollution, nanotechnology, and semiconductor research. At smaller magnifications TEM image contrast is due to absorption of electrons in the material, due to the thickness and composition of the material. At higher magnifications complex wave interactions modulate the intensity of the image, requiring expert analysis of observed images. Alternate modes of use allow for the TEM to observe modulations in chemical identity, crystal orientation, electronic structure and sample induced electron phase shift as well as the regular absorption based imaging. The first TEM was built by Max Knoll and Ernst Ruska in 1931, with this group developing the first TEM with resolution greater than that of light in 1933 and the first commercial TEM in 1939. In 1986, Ruska was awarded the Nobel Prize in physics for the development of transmission electron microscopy. Ernst Abbe originally proposed that the ability to resolve detail in an object was limited approximately by the wavelength of the light used in imaging, which limits the resolution of an optical microscope to a few hundred nanometers. Developments into ultraviolet (UV) microscopes, led by Köhler and Rohr, allowed for an increase in resolving power of about a factor of two. However this required more expensive quartz optical components, due to the absorption of UV by glass. At this point it was believed that obtaining an image with sub-micrometer information was simply impossible due to this wavelength constraint. It had earlier been recognized by Plücker in 1858 that the deflection of "cathode rays" (electrons) was possible by the use of magnetic fields. This effect had been utilized to build primitive cathode ray oscilloscopes (CROs) as early as 1897 by Ferdinand Braun, intended as a measurement device. Indeed, in 1891 it was recognized by Riecke that the cathode rays could be focused by these magnetic fields, allowing for simple lens designs. Later this theory was extended by Hans Busch in his work published in 1926, who showed that the lens maker's equation could, under appropriate assumptions, be applicable to electrons. In 1928, at the Technological University of Berlin Adolf Matthias, Professor of High voltage Technology and Electrical Installations, appointed Max Knoll to lead a team of researchers to advance the CRO design. The team consisted of several PhD students including Ernst Ruska and Bodo von Borries. This team of researchers concerned themselves with lens design and CRO column placement, which they attempted to obtain the parameters that could be optimized to allow for construction of better CROs, as well as the development of electron optical components which could be used to generate low magnification (nearly 1:1) images. 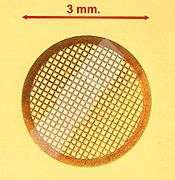 In 1931 the group successfully generated magnified images of mesh grids placed over the anode aperture. The device used two magnetic lenses to achieve higher magnifications, arguably the first electron microscope. In that same year, Reinhold Rudenberg, the scientific director of the Siemens company, had patented an electrostatic lens electron microscope. At this time the wave nature of electrons, which were considered charged matter particles, had not been fully realized until the publication of the De Broglie hypothesis in 1927. The group was unaware of this publication until 1932, where it was quickly realized that the De Broglie wavelength of electrons was many orders of magnitude smaller than that for light, theoretically allowing for imaging at atomic scales. In April 1932, Ruska suggested the construction of a new electron microscope for direct imaging of specimens inserted into the microscope, rather than simple mesh grids or images of apertures. With this device successful diffraction and normal imaging of aluminium sheet was achieved, however exceeding the magnification achievable with light microscopy had still not been successfully demonstrated. This goal was achieved in September 1933, using images of cotton fibers, which were quickly acquired before being damaged by the electron beam. At this time, interest in the electron microscope had increased, with other groups, such as Paul Anderson and Kenneth Fitzsimmons of Washington State University, and Albert Prebus and James Hillier at the University of Toronto who constructed the first TEMs in North America in 1935 and 1938, respectively, continually advancing TEM design. Research continued on the electron microscope at Siemens in 1936, the aim of the research was the development improvement of TEM imaging properties, particularly with regard to biological specimens. At this time electron microscopes were being fabricated for specific groups, such as the "EM1" device used at the UK National Physical Laboratory. 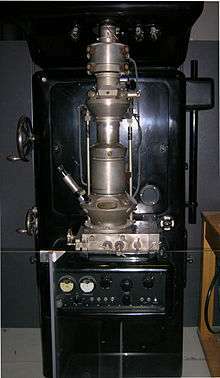 In 1939 the first commercial electron microscope, pictured, was installed in the Physics department of IG Farben-Werke. Further work on the electron microscope was hampered by the destruction of a new laboratory constructed at Siemens by an air-raid, as well as the death of two of the researchers, Heinz Müller and Friedrick Krause during World War II. Theoretically, the maximum resolution, d, that one can obtain with a light microscope has been limited by the wavelength of the photons that are being used to probe the sample, λ and the numerical aperture of the system, NA. where n is the index of refraction of the medium in which the lens is working and α is the angle of light that can enter the lens (see numerical aperture). Early twentieth century scientists theorized ways of getting around the limitations of the relatively large wavelength of visible light (wavelengths of 400–700 nanometers) by using electrons. Like all matter, electrons have both wave and particle properties (as theorized by Louis-Victor de Broglie), and their wave-like properties mean that a beam of electrons can be made to behave like a beam of electromagnetic radiation. The wavelength of electrons is related to their kinetic energy via the de Broglie equation. An additional correction must be made to account for relativistic effects, as in a TEM an electron's velocity approaches the speed of light, c.
From the top down, the TEM consists of an emission source, which may be a tungsten filament, or a lanthanum hexaboride (LaB6) source. For tungsten, this will be of the form of either a hairpin-style filament, or a small spike-shaped filament. LaB6 sources utilize small single crystals. By connecting this gun to a high voltage source (typically ~100–300 kV) the gun will, given sufficient current, begin to emit electrons either by thermionic or field electron emission into the vacuum. This extraction is almost always aided by the use of a Wehnelt cylinder to provide preliminary focus by consolidating and directing the electrons in these initial phases of forming the emitted electrons into a beam. The upper lenses of the TEM then further focus the electron beam to the desired size and location for subsequent interaction with the sample. Manipulation of the electron beam is performed using two physical effects. The interaction of electrons with a magnetic field will cause electrons to move according to the left hand rule, thus allowing for electromagnets to manipulate the electron beam. The use of magnetic fields allows for the formation of a magnetic lens of variable focusing power, the lens shape originating due to the distribution of magnetic flux. Additionally, electrostatic fields can cause the electrons to be deflected through a constant angle. Coupling of two deflections in opposing directions with a small intermediate gap allows for the formation of a shift in the beam path, this being used in TEM for beam shifting, subsequently this is extremely important to STEM. From these two effects, as well as the use of an electron imaging system, sufficient control over the beam path is possible for TEM operation. The optical configuration of a TEM can be rapidly changed, unlike that for an optical microscope, as lenses in the beam path can be enabled, have their strength changed, or be disabled entirely simply via rapid electrical switching, the speed of which is limited by effects such as the magnetic hysteresis of the lenses. The lenses of a TEM allow for beam convergence, with the angle of convergence as a variable parameter, giving the TEM the ability to change magnification simply by modifying the amount of current that flows through the coil, quadrupole or hexapole lenses. The quadrupole lens is an arrangement of electromagnetic coils at the vertices of the square, enabling the generation of a lensing magnetic fields, the hexapole configuration simply enhances the lens symmetry by using six, rather than four coils. Typically a TEM consists of three stages of lensing. The stages are the condenser lenses, the objective lenses, and the projector lenses. 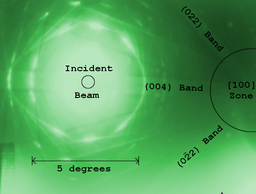 The condenser lenses are responsible for primary beam formation, while the objective lenses focus the beam that comes through the sample itself (in STEM scanning mode, there are also objective lenses above the sample to make the incident electron beam convergent). The projector lenses are used to expand the beam onto the phosphor screen or other imaging device, such as film. The magnification of the TEM is due to the ratio of the distances between the specimen and the objective lens' image plane. Additional stigmators allow for the correction of asymmetrical beam distortions, known as astigmatism. It is noted that TEM optical configurations differ significantly with implementation, with manufacturers using custom lens configurations, such as in spherical aberration corrected instruments, or TEMs utilizing energy filtering to correct electron chromatic aberration. High-voltage TEMs require ultra-high vacuums on the range of 10−7 to 10−9 Pa to prevent the generation of an electrical arc, particularly at the TEM cathode. As such for higher voltage TEMs a third vacuum system may operate, with the gun isolated from the main chamber either by gate valves or a differential pumping aperture - a small hole that prevents the diffusion of gas molecules into the higher vacuum gun area faster than they can be pumped out. For these very low pressures, either an ion pump or a getter material is used. 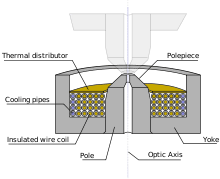 TEM specimen stage designs include airlocks to allow for insertion of the specimen holder into the vacuum with minimal increase in pressure in other areas of the microscope. The specimen holders are adapted to hold a standard size of grid upon which the sample is placed or a standard size of self-supporting specimen. Standard TEM grid sizes are a 3.05 mm diameter ring, with a thickness and mesh size ranging from a few to 100 μm. The sample is placed onto the inner meshed area having diameter of approximately 2.5 mm. Usual grid materials are copper, molybdenum, gold or platinum. This grid is placed into the sample holder, which is paired with the specimen stage. A wide variety of designs of stages and holders exist, depending upon the type of experiment being performed. In addition to 3.05 mm grids, 2.3 mm grids are sometimes, if rarely, used. These grids were particularly used in the mineral sciences where a large degree of tilt can be required and where specimen material may be extremely rare. Electron transparent specimens have a thickness around 100 nm, but this value depends on the accelerating voltage. Once inserted into a TEM, the sample often has to be manipulated to present the region of interest to the beam, such as in single grain diffraction, in a specific orientation. To accommodate this, the TEM stage includes mechanisms for the translation of the sample in the XY plane of the sample, for Z height adjustment of the sample holder, and usually for at least one rotation degree of freedom for the sample. Thus a TEM stage may provide four degrees of freedom for the motion of the specimen. Most modern TEMs provide the ability for two orthogonal rotation angles of movement with specialized holder designs called double-tilt sample holders. Of note however is that some stage designs, such as top-entry or vertical insertion stages once common for high resolution TEM studies, may simply only have X-Y translation available. The design criteria of TEM stages are complex, owing to the simultaneous requirements of mechanical and electron-optical constraints and have thus generated many unique implementations. The second design is the top-entry holder consists of a cartridge that is several cm long with a bore drilled down the cartridge axis. The specimen is loaded into the bore, possibly utilizing a small screw ring to hold the sample in place. This cartridge is inserted into an airlock with the bore perpendicular to the TEM optic axis. 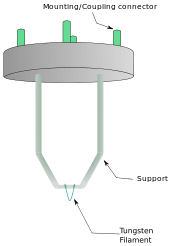 When sealed, the airlock is manipulated to push the cartridge such that the cartridge falls into place, where the bore hole becomes aligned with the beam axis, such that the beam travels down the cartridge bore and into the specimen. Such designs are typically unable to be tilted without blocking the beam path or interfering with the objective lens. 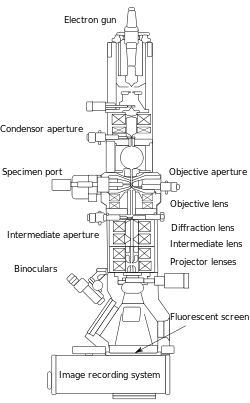 The electron gun is formed from several components: the filament, a biasing circuit, a Wehnelt cap, and an extraction anode. By connecting the filament to the negative component power supply, electrons can be "pumped" from the electron gun to the anode plate, and TEM column, thus completing the circuit. The gun is designed to create a beam of electrons exiting from the assembly at some given angle, known as the gun divergence semi-angle, α. By constructing the Wehnelt cylinder such that it has a higher negative charge than the filament itself, electrons that exit the filament in a diverging manner are, under proper operation, forced into a converging pattern the minimum size of which is the gun crossover diameter. This equation shows that in order to achieve sufficient current density it is necessary to heat the emitter, taking care not to cause damage by application of excessive heat, for this reason materials with either a high melting point, such as tungsten, or those with a low work function (LaB6) are required for the gun filament. Furthermore, both lanthanum hexaboride and tungsten thermionic sources must be heated in order to achieve thermionic emission, this can be achieved by the use of a small resistive strip. To prevent thermal shock, there is often a delay enforced in the application of current to the tip, to prevent thermal gradients from damaging the filament, the delay is usually a few seconds for LaB6, and significantly lower for tungsten. The coils which produce the magnetic field are located within the lens yoke. The coils can contain a variable current, but typically utilize high voltages, and therefore require significant insulation in order to prevent short-circuiting the lens components. Thermal distributors are placed to ensure the extraction of the heat generated by the energy lost to resistance of the coil windings. The windings may be water-cooled, using a chilled water supply in order to facilitate the removal of the high thermal duty. Imaging methods in TEM utilize the information contained in the electron waves exiting from the sample to form an image. The projector lenses allow for the correct positioning of this electron wave distribution onto the viewing system. The observed intensity, I, of the image, assuming sufficiently high quality of imaging device, can be approximated as proportional to the time-averaged amplitude of the electron wavefunctions, where the wave that forms the exit beam is denoted by Ψ. Contrast formation in the TEM depends greatly on the mode of operation. Complex imaging techniques, which utilize the unique ability to change lens strength or to deactivate a lens, allow for many operating modes. These modes may be used to discern information that is of particular interest to the investigator. The most common mode of operation for a TEM is the bright field imaging mode. In this mode the contrast formation, when considered classically, is formed directly by occlusion and absorption of electrons in the sample. Thicker regions of the sample, or regions with a higher atomic number will appear dark, whilst regions with no sample in the beam path will appear bright – hence the term "bright field". The image is in effect assumed to be a simple two dimensional projection of the sample down the optic axis, and to a first approximation may be modelled via Beer's law, more complex analyses require the modelling of the sample to include phase information. Utilizing the advanced technique of EELS, for TEMs appropriately equipped electrons can be rejected based upon their voltage (which, due to constant charge is their energy), using magnetic sector based devices known as EELS spectrometers. These devices allow for the selection of particular energy values, which can be associated with the way the electron has interacted with the sample. For example, different elements in a sample result in different electron energies in the beam after the sample. This normally results in chromatic aberration – however this effect can, for example, be used to generate an image which provides information on elemental composition, based upon the atomic transition during electron-electron interaction. Crystal structure can also be investigated by high-resolution transmission electron microscopy (HRTEM), also known as phase contrast. When utilizing a Field emission source and a specimen of uniform thickness, the images are formed due to differences in phase of electron waves, which is caused by specimen interaction. Image formation is given by the complex modulus of the incoming electron beams. As such, the image is not only dependent on the number of electrons hitting the screen, making direct interpretation of phase contrast images more complex. However this effect can be used to an advantage, as it can be manipulated to provide more information about the sample, such as in complex phase retrieval techniques. As previously stated, by adjusting the magnetic lenses such that the back focal plane of the lens rather than the imaging plane is placed on the imaging apparatus a diffraction pattern can be generated. For thin crystalline samples, this produces an image that consists of a pattern of dots in the case of a single crystal, or a series of rings in the case of a polycrystalline or amorphous solid material. For the single crystal case the diffraction pattern is dependent upon the orientation of the specimen and the structure of the sample illuminated by the electron beam. This image provides the investigator with information about the space group symmetries in the crystal and the crystal's orientation to the beam path. This is typically done without utilizing any information but the position at which the diffraction spots appear and the observed image symmetries. Sample preparation in TEM can be a complex procedure. 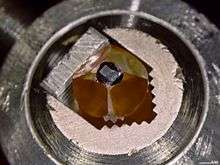 TEM specimens are required to be at most hundreds of nanometers thick, as unlike neutron or X-Ray radiation the electron beam interacts readily with the sample, an effect that increases roughly with atomic number squared (z2). High quality samples will have a thickness that is comparable to the mean free path of the electrons that travel through the samples, which may be only a few tens of nanometers. Preparation of TEM specimens is specific to the material under analysis and the desired information to obtain from the specimen. As such, many generic techniques have been used for the preparation of the required thin sections. Materials that have dimensions small enough to be electron transparent, such as powders or nanotubes, can be quickly prepared by the deposition of a dilute sample containing the specimen onto support grids or films. In the biological sciences in order to withstand the instrument vacuum and facilitate handling, biological specimens can be fixated using either a negative staining material such as uranyl acetate or by plastic embedding. Alternately samples may be held at liquid nitrogen temperatures after embedding in vitreous ice. In material science and metallurgy the specimens tend to be naturally resistant to vacuum, but still must be prepared as a thin foil, or etched so some portion of the specimen is thin enough for the beam to penetrate. Constraints on the thickness of the material may be limited by the scattering cross-section of the atoms from which the material is comprised. By passing samples over a glass or diamond edge, small, thin sections can be readily obtained using a semi-automated method. This method is used to obtain thin, minimally deformed samples that allow for the observation of tissue samples. Additionally inorganic samples have been studied, such as aluminium, although this usage is limited owing to the heavy damage induced in the less soft samples. To prevent charge build-up at the sample surface, tissue samples need to be coated with a thin layer of conducting material, such as carbon, where the coating thickness is several nanometers. 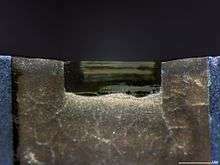 This may be achieved via an electric arc deposition process using a sputter coating device. Details in light microscope samples can be enhanced by stains that absorb light; similarly TEM samples of biological tissues can utilize high atomic number stains to enhance contrast. The stain absorbs electrons or scatters part of the electron beam which otherwise is projected onto the imaging system. Compounds of heavy metals such as osmium, lead, uranium or gold (in immuno-gold labeling) may be used prior to TEM observation to selectively deposit electron dense atoms in or on the sample in desired cellular or protein regions, requiring an understanding of how heavy metals bind to biological tissues. Mechanical polishing may be used to prepare samples. Polishing needs to be done to a high quality, to ensure constant sample thickness across the region of interest. A diamond, or cubic boron nitride polishing compound may be used in the final stages of polishing to remove any scratches that may cause contrast fluctuations due to varying sample thickness. Even after careful mechanical milling, additional fine methods such as ion etching may be required to perform final stage thinning. SEM image of a thin TEM sample milled by FIB. The thin membrane shown here is suitable for TEM examination; however, at ~300-nm thickness, it would not be suitable for high-resolution TEM without further milling. Samples may also be replicated using cellulose acetate film, the film subsequently coated with a heavy metal, the original film melted away, and the replica imaged on the TEM. This technique is used for both materials and biological samples. The capabilities of the TEM can be further extended by additional stages and detectors, sometimes incorporated on the same microscope. 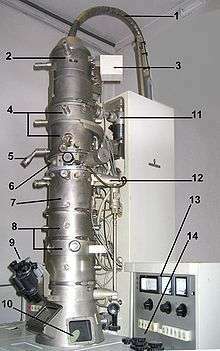 An electron cryomicroscope (CryoTEM) is a TEM with a specimen holder capable of maintaining the specimen at liquid nitrogen or liquid helium temperatures. This allows imaging specimens prepared in vitreous ice, the preferred preparation technique for imaging individual molecules or macromolecular assemblies. In-situ experiments may also be conducted with experiments such as in-situ reactions or material deformation testing. Modern research TEMs may include aberration correctors, to reduce the amount of distortion in the image. Incident beam monochromators may also be used which reduce the energy spread of the incident electron beam to less than 0.15 eV. Major TEM makers include JEOL, Hitachi High-technologies, FEI Company (from merging with Philips Electron Optics), Carl Zeiss and NION. Carl Zeiss AG no longer makes TEM focusing on SEM and HIM instead. A low-voltage electron microscope (LVEM) is operated at relatively low electron accelerating voltage between 5-25 kV. Some of these can be a combination of SEM, TEM and STEM in a single compact instrument. Low voltage increases image contrast which is especially important for biological specimens. This increase in contrast significantly reduces, or even eliminates the need to stain. Resolutions of a few nm are possible in TEM, SEM and STEM modes. The low energy of the electron beam means that permanent magnets can be used as lenses and thus a miniature column that does not require cooling can be used. This technique allows TEM's to be used to see molecular structure of proteins and large molecules. Cryoelectron microscopy involves viewing unaltered macro-molecular assemblies by vitrifying them, placing them on a grid and obtaining images by detecting electrons that transmit through the specimen. Approximate tendency of spatial resolution achieved with TEM. 1 2 "The Nobel Prize in Physics 1986, Perspectives – Life through a Lens". nobelprize.org. 1 2 3 Ernst Ruska; translation by T Mulvey. The Early Development of Electron Lenses and Electron Microscopy. ISBN 3-7776-0364-3. ↑ Plücker, J. (1858). "Über die Einwirkung des Magneten auf die elektrischen Entladungen in verdünnten Gasen" [On the effect of a magnet on the electric discharge in rarified gases]. Poggendorffs Annalen der Physik und Chemie. 103: 88–106. Bibcode:1858AnP...179...88P. doi:10.1002/andp.18581790106. ↑ "Ferdinand Braun, The Nobel Prize in Physics 1909, Biography". nobelprize.org. ↑ Rudenberg, Reinhold (May 30, 1931). "Configuration for the enlarged imaging of objects by electron beams". Patent DE906737. ↑ Broglie, L. (1928). "La nouvelle dynamique des quanta". Électrons et Photons: Rapports et Discussions du Cinquième Conseil de Physique. Solvay. ↑ "A Brief History of the Microscopy Society of America". microscopy.org. ↑ "Dr. James Hillier, Biography". comdir.bfree.on.ca. 1 2 Hawkes, P. (Ed.) (1985). The beginnings of Electron Microscopy. Academic Press. ISBN 0120145782. 1 2 "Ernst Ruska, Nobel Prize Lecture". nobelprize.org. ↑ Meyer, Jannik C.; Girit, C. O.; Crommie, M. F.; Zettl, A. (2008). "Imaging and dynamics of light atoms and molecules on graphene" (PDF). Nature. Berkeley. 454 (7202): 319–22. arXiv:0805.3857 . Bibcode:2008Natur.454..319M. doi:10.1038/nature07094. PMID 18633414. Retrieved 3 June 2012. 1 2 3 Fultz, B & Howe, J (2007). Transmission Electron Microscopy and Diffractometry of Materials. Springer. ISBN 3-540-73885-1. ↑ Champness, P. E. (2001). Electron Diffraction in the Transmission Electron Microscope. Garland Science. ISBN 978-1859961476. ↑ Hubbard, A (1995). The Handbook of surface imaging and visualization. CRC Press. ISBN 0-8493-8911-9. ↑ Egerton, R (2005). Physical principles of electron microscopy. Springer. ISBN 0-387-25800-0. 1 2 3 4 5 Rose, H H (2008). "Optics of high-performance electron Microscopes". Science and Technology of Advanced Materials. 9: 014107. Bibcode:2008STAdM...9a4107R. doi:10.1088/0031-8949/9/1/014107. ↑ "The objective lens of a TEM, the heart of the electron microscope". rodenburg.org. 1 2 3 4 Williams, D & Carter, C. B. (1996). Transmission Electron Microscopy. 1 – Basics. Plenum Press. ISBN 0-306-45324-X. ↑ Rodenburg, J M. "The Vacuum System". rodenburg.org. 1 2 Ross, L. E, Dykstra, M (2003). 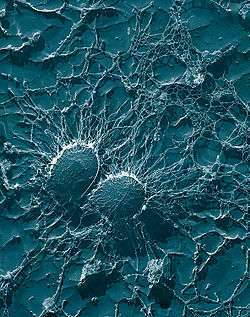 Biological Electron Microscopy: Theory, techniques and troubleshooting. Springer. ISBN 0306477491. 1 2 Chapman, S. K. (1986). Maintaining and Monitoring the Transmission Electron Microscope. Royal Microscopical Society Microscopy Handbooks. 08. Oxford University Press. ISBN 0-19-856407-4. ↑ Pulokas, James; Green, Carmen; Kisseberth, Nick; Potter, Clinton S.; Carragher, Bridget (1999). "Improving the Positional Accuracy of the Goniometer on the Philips CM Series TEM". Journal of Structural Biology. 128 (3): 250–256. doi:10.1006/jsbi.1999.4181. PMID 10633064. ↑ Buckingham, J (1965). "Thermionic emission properties of a lanthanum hexaboride/rhenium cathode". British Journal of Applied Physics. 16 (12): 1821. Bibcode:1965BJAP...16.1821B. doi:10.1088/0508-3443/16/12/306. 1 2 Orloff, J, ed. (1997). Handbook of Electron Optics. CRC-press. ISBN 0-8493-2513-7. 1 2 3 Cowley, J. M (1995). Diffraction physics. Elsevier Science B. V. ISBN 0-444-82218-6. 1 2 Kirkland, E (1998). Advanced computing in Electron Microscopy. Springer. ISBN 0-306-45936-1. ↑ Hull, D. & Bacon, J (2001). Introduction to dislocations (4th ed.). Butterworth-Heinemann. ISBN 0-7506-4681-0. ↑ Egerton, R. F. (1996). Electron Energy-loss Spectroscopy in the Electron Microscope. Springer. ISBN 978-0-306-45223-9. ↑ Cowley, J. M.; Moodie, A. F. (1957). "The Scattering of Electrons by Atoms and Crystals. I. A New Theoretical Approach". Acta Crystallographica. 199 (3): 609–619. doi:10.1107/S0365110X57002194. ↑ Mast, Jan; Demeestere, Lien (2009). "Electron tomography of negatively stained complex viruses: application in their diagnosis". Diagnostic Pathology. 4: 5. doi:10.1186/1746-1596-4-5. PMC 2649040 . PMID 19208223. 1 2 Frank, J, ed. (2006). Electron tomography: methods for three-dimensional visualization of structures in the cell. Springer. ISBN 978-0-387-31234-7. ↑ Kawase, Noboru; Kato, Mitsuro; Jinnai, Hiroshi; Jinnai, H (2007). "Transmission electron microtomography without the 'missing wedge' for quantitative structural analysis". Ultramicroscopy. 107 (1): 8–15. doi:10.1016/j.ultramic.2006.04.007. PMID 16730409. ↑ Heidari, Hamed; Van den Broek, Wouter; Bals, Sara (2013). "Quantitative electron tomography: The effect of the three-dimensional point spread function". Ultramicroscopy. 135: 1–5. doi:10.1016/j.ultramic.2013.06.005. PMID 23872036. ↑ Cheville, NF; Stasko J (2014). "Techniques in Electron Microscopy of Animal Tissue". Veterinary Pathology. 51 (1): 28–41. doi:10.1177/0300985813505114. PMID 24114311. ↑ Amzallag, Arnaud; Vaillant, Cédric; Jacob, Mathews; Unser, Michael; Bednar, Jan; Kahn, Jason D.; Dubochet, Jacques; Stasiak, Andrzej; Maddocks, John H. (2006). "3D reconstruction and comparison of shapes of DNA minicircles observed by cryo-electron microscopy". Nucleic Acids Research. 34 (18): e125. doi:10.1093/nar/gkl675. PMC 1635295 . PMID 17012274. ↑ Porter, K & Blum, J (1953). "A study in Microtomy for Electron Microscopy". The Anatomical Record. 117 (4): 685–710. doi:10.1002/ar.1091170403. PMID 13124776. ↑ Phillips (1961). "Diamond knife ultra microtomy of metals and the structure of microtomed sections". British Journal of Applied Physics. 12 (10): 554. Bibcode:1961BJAP...12..554P. doi:10.1088/0508-3443/12/10/308. ↑ Alberts, Bruce (2008). Molecular biology of the cell (5th ed.). New York: Garland Science. ISBN 0815341113. ↑ Baram, M. & Kaplan W. D. (2008). "Quantitative HRTEM analysis of FIB prepared specimens". Journal of Microscopy. 232 (3): 395–05. doi:10.1111/j.1365-2818.2008.02134.x. PMID 19094016. ↑ Li, Z; Baker, ML; Jiang, W; Estes, MK; Prasad, BV (2009). "Rotavirus Architecture at Subnanometer Resolution". Journal of Virology. 83 (4): 1754–1766. doi:10.1128/JVI.01855-08. PMC 2643745 . PMID 19036817. ↑ Haque, M. A. & Saif, M. T. A. (2001). 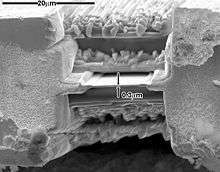 "In-situ tensile testing of nano-scale specimens in SEM and TEM". Experimental Mechanics. 42: 123. doi:10.1007/BF02411059. ↑ Nebesářová1, Jana; Vancová, Marie (2007). "How to Observe Small Biological Objects in Low-Voltage Electron Microscope". Microscopy and Microanalysis. 13 (3): 248–249. Retrieved 8 August 2016. ↑ Drummy, Lawrence, F.; Yang, Junyan; Martin, David C. (2004). "Low-voltage electron microscopy of polymer and organic molecular thin films". Ultramicroscopy. 99 (4): 247–256. doi:10.1016/j.ultramic.2004.01.011. PMID 15149719. ↑ Henderson R (2004). "Realizing the potential of electron cryo-microscopy". Q. Rev. Biophys. 37 (1): 3–13. doi:10.1017/S0033583504003920. PMID 17390603. ↑ Rickerby, David G.; Valdrè, Giovanni; Valdrè, Ugo (1999). Impact of electron and scanning probe microscopy on materials research. Springer. pp. 3–. ISBN 978-0-7923-5939-5. 1 2 3 Erni, Rolf; Rossell, MD; Kisielowski, C; Dahmen, U (2009). "Atomic-Resolution Imaging with a Sub-50-pm Electron Probe". Physical Review Letters. 102 (9): 096101. Bibcode:2009PhRvL.102i6101E. doi:10.1103/PhysRevLett.102.096101. PMID 19392535. 1 2 Furuya, Kazuo (2008). "Nanofabrication by advanced electron microscopy using intense and focused beam". Science and Technology of Advanced Materials. 9: 014110. Bibcode:2008STAdM...9a4110F. doi:10.1088/1468-6996/9/1/014110. ↑ Stahlberg, Henning (September 6, 2012). "Contrast Transfer Functions". 2dx.unibas.ch. ↑ Tanaka, Nobuo (2008). "Present status and future prospects of spherical aberration corrected TEM/STEM for study of nanomaterials". Sci. Technol. Adv. Mater. 9: 014111. Bibcode:2008STAdM...9a4111T. doi:10.1088/1468-6996/9/1/014111.